Appeal by Mary's Meals – Today: Mary’s Meals will be at church this weekend (up to the Latin Mass) to collect all your unwanted clothing/bedding (no duvets or pillows). Please bring all your bags before 11 am. Please ensure all clothing/bedding is put into tied black sacks - 4 full sacks will feed a child one good nutritious meal every school day for a whole year! Thank you. French / Italian Readers needed for All Souls day: If you would like to be a reader at either of these Masses, please see Fr Przemek this weekend. Marcia Williams RIP: Her Requiem will be held at St John Fisher in Merton (207 Cannon Hill Lane, SW20 9DB) on Friday 3rd November 12.45pm. Please note this time printed in the newsletter last week is incorrect. Youth Club: Next Sunday (5th November) after the 6pm Mass we will re-start the Youth Club. The Youth Club is for anyone aged 10 to 15 years old. Confirmation application forms will be available at this time. Welcome back to our Schools: we hope all our staff & pupils have had a nice & restful half-term break. 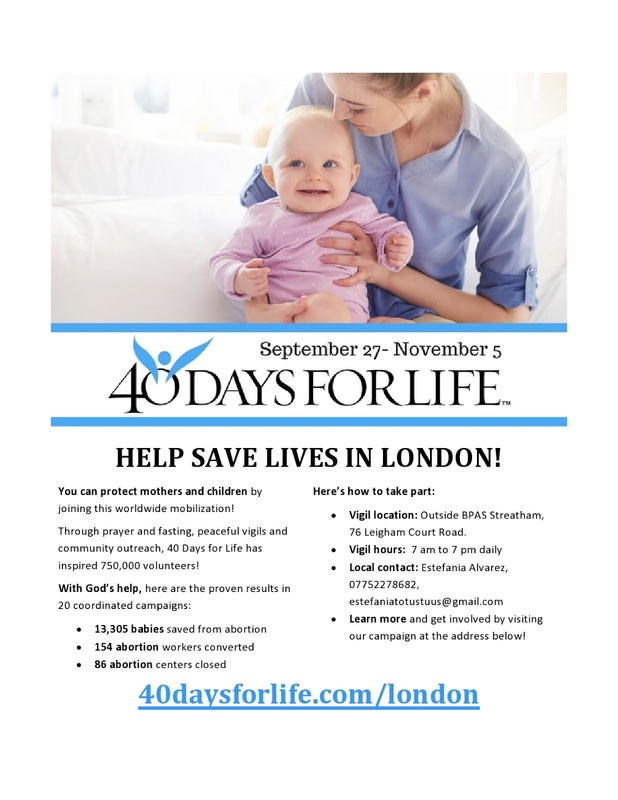 50th Anniversary of the Abortion Act: This past Friday marked the anniversary of this act becoming law. In our Holy Communions and time before the Tabernacle let us make reparation for this huge and obscene loss of innocent life. Annual Good Counsel Ball: Saturday 11th November at the Palace Suite, Royal Garden Hotel, Kensington. Doors open at 6pm with dinner starting promptly at 7pm. Costs £95 per person (black tie event), and to book tickets you will need to email gcnball@gmail.com as soon as possible. 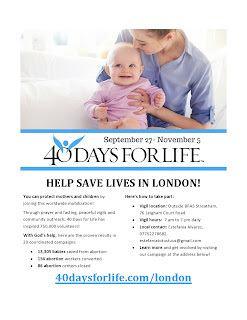 40 Days for Life: comes to an end next Sunday.